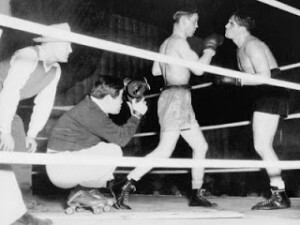 Many fine movies have been set in and around the boxing ring. Most of them borrow from the subgenre’s touchstone, which is this week’s film recommendation: The 1947 classic Body and Soul. 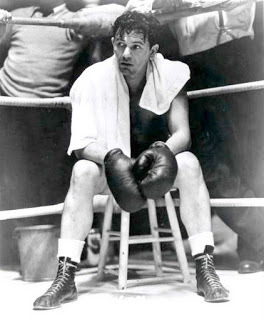 The hero of the story is up-from-nothing Charley Davis (John Garfield), a scrappy boxer looking for a shot at the championship. Unfortunately, that means throwing in with the criminals who control the whole rotten enterprise and exploit everyone in it. As celebrity and money go to his head, Charley is drawn away from the decent values and people from his old neighborhood and towards the glamorous but amoral people who spend their lives in society’s upper echelons. Charlie thinks he is on top of the world. But then the bosses order him to throw a big fight so that they can cash in by betting against him, pushing him to the point of emotional and ethical crisis. This movie suffers a bit from the Hitchcock problem: Its elements have been aped so many times in subsequent films that they may come across to modern viewers as cliched. But try to get past that unfair but understandable reaction and feast yourself on a sharply-written, unforgettably photographed and acted piece of cinema. The rewards for viewers are many. Garfield is superb as Charley, bringing alive his character’s mix of toughness and boyish vulnerability. It’s a complex performance of impressive maturity from a fairly young actor (who unfortunately never got to become an old one, he died just a few years later). Abraham Polonsky’s memorable script creates a triangle around Charley, with the other two points being strong, well-rounded female characters: Charley’s long suffering fiance Peg and his mother, Anna. These roles are brilliantly essayed by Lili Palmer and Anna Revere, respectively. In particular, the scenes of the three of them together in Anna’s house are absolutely riveting. These confrontations are also beautifully blocked and lit as the three performers move from the kitchen in the foreground to the small bedroom in the background which has a window where there really ought to be a wall (Realistic architecture maybe not, but the effect is so striking that you will not care). This film is also justly legendary as a showcase for my favorite cinematographer, James Wong Howe. The boxing scenes are astonishing in their vividness (Robert Parrish and Francis Lyon’s Oscar-winning editing is priceless). Until I saw this photo I wondered if it were just a Hollywood legend that Howe shot them on rollerskates! Howe also shines outside the ring, given the viewer a gritty, realistic cityscape in which this dark story unfolds. Although on the surface this movie is of course about pugilism, at a deeper level it’s about low-income outgroups (Jews and Blacks) trying to make good in a corrupt, oppressive and money-grubbing system. Virtually everyone involved in the production were members of the hard left and would soon be persecuted by McCarthyites as a result. But they had a free hand here for their pro-underdog politics, and they pulled no punches. Next Next post: Hospice enrolling well patients to kill them?